Andrew “Rocky” Raczkowski showed a photo he took of some graffiti on a wall in the Middle East where he served with the U.S. Army. “If you take the handcuffs off the soldiers and let us fight, I think we could win it very quickly,” Raczkowski told a crowd of about 140 people in Pontiac on Saturday during a two-presentation on the war on terror. 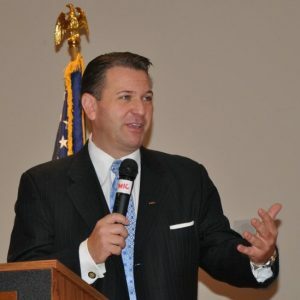 Raczkowski is running with fellow GOP candidate Paul Welday in the U.S. Representative 9th Congressional District to unseat Democrat Gary Peters. Raczkowski is a captain in the U.S. Army reserve and served throughout the Middle East in Operation Enduring Freedom – the name given to the wars in Iraq and Afghanistan. Raczkowski said his comments were made as a private citizen and not in his capacity with the U.S. Army. He said the approach has been “too politically correct.” He said a quick ending would mean many more civilian casualties. “You don’t send them off to war and then make a political decision,” Raczkowski said. After the meeting, Raczkowski said he didn’t like the approach of the war on terror by former President George Bush or President Barack Obama. He criticized Obama for not making a decision on troop deployment to Afghanistan. “As our men and women are dying, he is taking his time to determine a policy,” Raczkowski said. He said Bush sent the troops over but then did little else. The U.S. military is the premiere fighting force in the world, he said. The U.S. immigration policy was putting this country at risk, Raczkowski said. He pointed to the news reports of Shirwa Ahmed, a Somalian refugee who came to the U.S. and become a naturalized citizen and was living in Minnesota. According to the Washington Post, the FBI and CIA believe Ahmed blew himself up in Somalia on Oct. 29 in five simultaneous bombings attributed to al-Shabaab, a group linked to al-Qaeda. After the meeting ended, Raczkowski said lax immigration around Mexico is also a problem as some terrorists are getting into the U.S. through the southern border. The presentation shed light on many aspects of the war from recently declassified information. • He showed video of an improvised explosive device – or roadside bomb – going off and lifting large mounds of pavement 15 feet into the air like a wave. • There was video of drone bombings. It showed how a remote controlled drone captured enemy combatants on a road at night in Afghanistan. That drone gave the signal to soldiers back home at a Las Vegas base. Those U.S. soldiers were able to use joysticks and, with the images provided by the drone, wipe out the soldiers with surgical strikes.